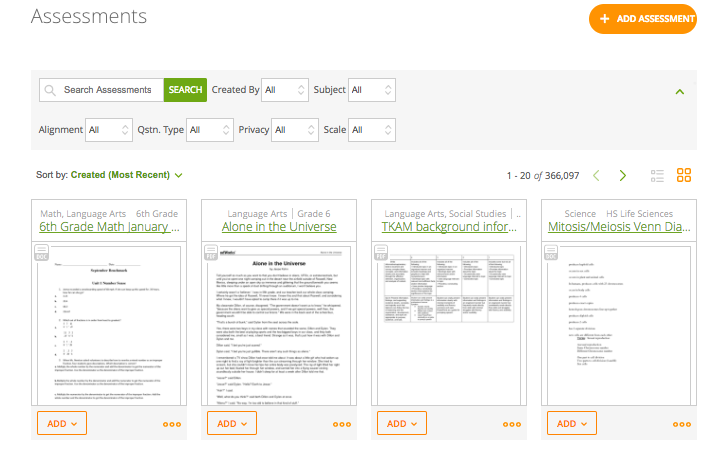 Use the drop-down menus to sort and filter assessments. Select the Subject, then select any additional options for that subject. Click the caret on the top right to sort by Alignment, Question Type, Privacy, and Scale. Hover over the assessment to view additional information, such as the scoring, standards alignment, answer key, and who created the assessment. You can also click on the assessment title to view the assessment. To add the assessment to a tracker you have created, click on Add and select the tracker or curriculum map you would like to add it to. Select the check box for the tracker you want to add it to, and click on Add. If you do not have a tracker set up yet, you can also click on Bookmark to save the assessment in your bookmarks and return to it later.